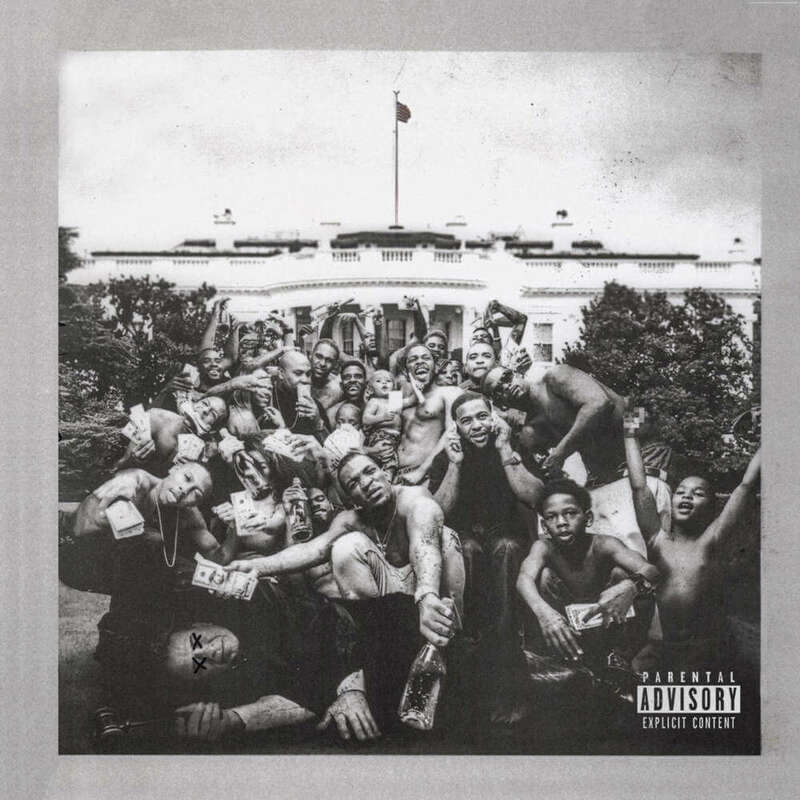 Out of every album I listened to this year, there is a clear favorite distinguished in my heart and mind: Kendrick Lamar’s To Pimp A Butterfly. My relationship with Kendrick’s music began when I heard the song “Ignorance Is Bliss” off his Overly Dedicated mixtape from 2010. I was hooked. I could feel some sort of forbidden charisma he had on the mic. I knew he had a definitive ability to rip tracks and compose cohesive, conceptual songs. It remains my very favorite song of his to date. 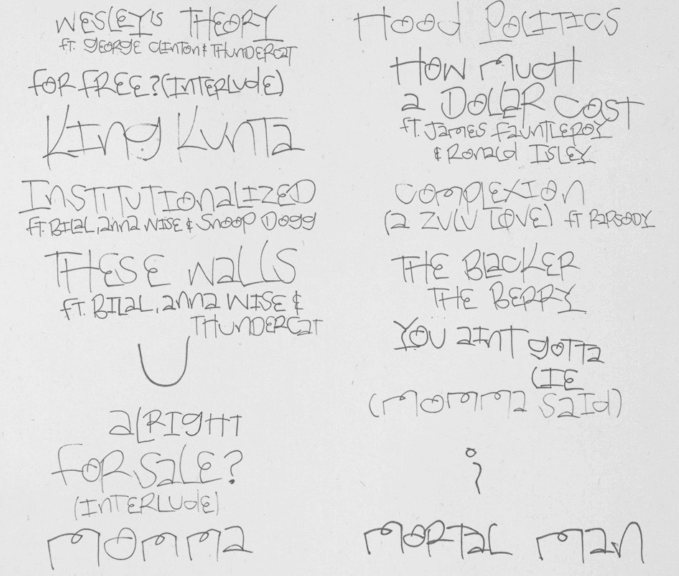 His 2011 album Section.80 came next — a perplexingly unique and distinctive project that never fails to give me chills — one of my personal favorite albums of all-time. One year later, he released good kid, M.A.A.D city to ubiquitous critical acclaim. Unlike (what seems like) everybody, I wasn’t blown away by it. It is an incredibly well-thought-out project with a captivating storyline, but I never fell in love with its sound. To Pimp A Butterfly, however… Jiminy Christmas. I was laying down with my eyes closed wearing headphones when the mosaic unraveled for the first time. K-Dot took me from the feeling of downfall, to laughter, to monstrosity, to entrapment, to sexual stagnation, to one of the deepest expressions of depression I’ve ever heard, to an anthem, to Lucy’s domicile, to a conceptual home, to the machinations of the hood, to the magnitude of the dollar, to loving your color, to a monumental hypocrisy, to the criticality of not faking the funk, to the importance of loving yourself, and ultimately to 2Pac’s mind — in that order — all to metaphorically establish a caterpillar emerging from a cocoon into a butterfly in a mere 79 minutes of my life. Afterwards, I put the headphones down and did not speak, move, or sleep (it was midnight on a Tuesday) for quite some time. I was on an emotional, conceptual roller coaster with so many questions. 10 months later, I’m still riding it. He enigmatically turned a turbulent flurry of thoughts and thick emotion into a cohesive conceptual masterpiece, with a gorgeous sound. For production, he chose to incorporate Terrace Martin’s saxophone brilliance, Thundercat’s bass wizardry, and the spacey sounds of Flying Lotus, Knxwledge and more. As far as the carefully-selected features, he got a diverse array of help from Snoop Dogg, Bilal, Rapsody, Ronald Isley, George Clinton, and more. My favorite track is “Momma” because I love the bottle-clinking production and the extent to which it’s open for interpretation. “Alright” is both a protest-anthem for contemporary #BlackLivesMatter, #SayHerName, etc. marches and a banger heard at functions worldwide… That’s nearly, if not completely unprecedented in Hip Hop to my knowledge. Kendrick’s ability to put together such a united, vast project with such widespread collaborations is simply remarkable to me. It embodies — in production and content — a wide variety of Hip Hop’s elements from the past, present, and future, while still offering a tad of that good ‘ol west coast flavor. When I first heard it, I predicted it would be my favorite album of 2015 and it has stood the test of time. After Section.80 had me fully infatuated, good kid, M.A.A.D city left me hungry; To Pimp A Butterfly proved to me that Kendrick has no foreseeable apex in sight. This album could go down in history as being in a class of its own. Even though many will say it isn’t in its own class, it sure wouldn’t take very long to call roll.